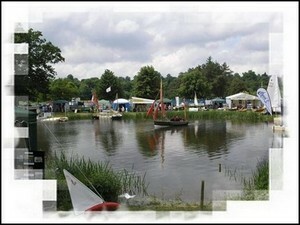 The Thames Boat Show, Beal Park 2008. Set against a stunning backdrop of the River Thames in Berkshire, this small Informal boat show is a relaxed antidote to bigger more commercial shows. The show began life, many years ago as the Wooden Boat Show. After moving to Beal Park it morphed into its present form and has grown considerably in recent years, attracting new exhibitors. However it has retained its emphasis on small boats and craftsmanship, while catering for a broad section of the boating community and introducing many to life at the water's edge. One of my own early memories of boating on the Thames came back to me in a Madeleine moment as I drove through the village of Pangbourne on my way to the boat show ground. Back in the mists of time, my then girl friend and I borrowed a rowing skiff from the landlord of the Thames side Swan Inn. We rowed upstream for a mile or two until we found a quiet grassy bank, where we spent an idyllic day picnicking, swimming and lazing in the sun. However, like that wandering beauty spot on Proust’s Albertine, we may or may not, have been on the river bank opposite Beal Park. I am however determined to believe the memory that we were in love, that the river bank was grassy and shaded by a willow tree and it was one of those bucolic English summer weekends that H.E. Bates’ Pop Larkin would have describe as ‘perfick, just perfick’. And the weather was ‘just perfick’ this weekend for the 2008 Thames Boat Show. It was unfortunate that the free trips on the river had to be cancelled, as the rain of the previous week had caused the Thames to be running rather fast. However, the seven acre lake, which is one of the showground's most outstanding features, enabled visitors to take to the water quickly, easily and safely. This lively event had lots to offer lovers of traditional small craft, with demonstrations to watch and small boats to see. The show featured all aspects of boating and many different craft. 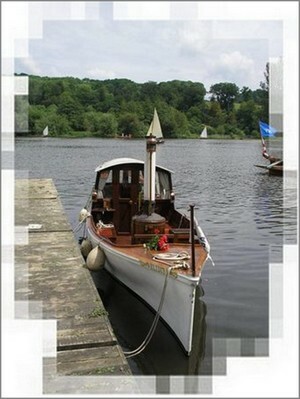 Boats ranged from dinghies and day boats to classic craft, narrow boats and cruisers. From coracle to plank-on-edge racers, sail, steam, oar or paddle, electric, solar and pedal powered craft, The Beale Park Thames Boat Show seemed to have something for everyone this year. There was even a display of plastic speed boats but it was easily ignored in favour of the majority of stands devoted to more traditional craft. One speed boat that did catch my attention was the wooden Twirler looking for all the world as though it could have been built by Antonio Stradivari. Perhaps when her seventy year old owner as tired of driving her at high speed he will have her restrung. 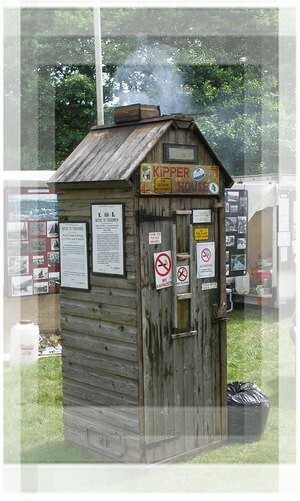 A much less visually sybaritic wooden structure was ‘The Kipperman’s’ mobile smoke house. While it may have looked like an example of a traditional ‘convenience’, Mike Smylie was using it to cure kippers in the traditional manner. He vehemently denies that the smoke house was ever previous used for any other purpose. Certainly the taste and aroma of the kippers he produced was testament to the efficaciousness of the building and to his enthusiasm. These were kippers at their best far removed from the imitations available in the supermarkets. The show is also a tribute to all those other enthusiasts (eccentrics?) 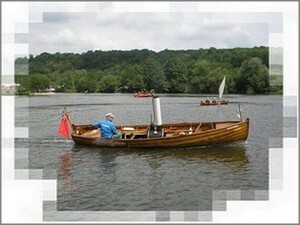 who have restored and maintained so many of the lovely old craft on display, especially the steam powered launches. Though strangely enough, in view of the increasing cost of oil, their enthusiasms are increasingly coming to seem not quite so strange. Far from being noisy and smelly and dirty the steam powered launches zipped around the lake surprisingly fast and with very little fuss and certainly no billowing dirty smoke. Despite their age they seemed to be quieter than the usual petrol and diesel engines. Also among the superbly maintained old craft were numerous examples of punts, skiffs and plain old rowing boats of the sort in use when Jerome K Jerome’s wrote his Three Men in a Boat about a rowing trip along this same stretch of the Thames. As the wooden boat building craft becomes less of commercially viable, for small builders, it is good to know that at least some are managing to keeping alive their individualism, despite the endeavours of the bureaucrats to reduce everything to an homogenous sameness. Fortunately there are many amateurs with a love for detail and pride in creating something of practical beauty. 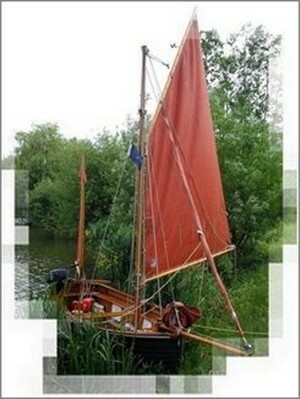 On show were the winning entries in an amateur boat building competition. These were not simply cobbled contraptions but superb examples of craftsmanship. The attention to detail and finish raising the craft into the realms of art. The joy of this boat show is its relaxed intimate nature. There are no pushy salesmen and no pressure to buy the latest electronic gee-jaw. But beware, for many of the displays are manned by not by salesmen but enthusiasts. Stop to chat for a few moments and you will find that the enthusiastic love for what they do is much more persuasive than any slick sales talk. And they all love to chat about their specialities. Well who doesn’t? The electric boating aficionados were apt to make more noise than their motors as they extolled the benefits of battery powered boating. However, I’m not sure that their green, quiet credentials stood up to scrutiny when it came to the question of recharging the batteries. There was also a hydrogen powered boat and one powered by solar panels on display but neither looked very elegant and I didn’t see them in action on the lake. As well as boating displays on the lake there were demonstrations by Newfoundland dogs showing off their swimming and lifesaving skills. There were also displays or arts and crafts, specialist food produce, cookery workshops, live music and dancing displays. This year there was also a Classic Car Display. Among the list, of the boat shows children's activities and attractions was Mr Toad maintaining the literary association with Kenneth Grahame’s "Wind in the Willows" which was written one hundred years ago this year, about of all things, the pleasure of ‘simply messing about in boats’. 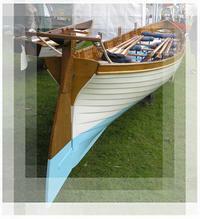 Do you have a favourite Wooden Boat Event or Festival? You can use the form below to share it with us. Entering your story is easy to do, just type and don't worry too much about syntax as I will proof your entry before publication. Or you can copy and paste from your word-processer.